Fort Fido good-old-boy, Dempsey, has been the cornerstone of the Big Roll since his first days in 2008. He is one awesome dog, that has shown great prowess and leadership in the pack. His owners are also some of the best, and most loyal, customers. Thank you for your support over the years! Anywho... Dempsey and the "Devlin Clan" have sworn in another member lol. Meet the radical little dude that is, Rusty! Rusty is a one year old, Chihuahua/Dachshund (maybe Corgi) Mix. Let me be the first to tell you... Rusty is one lucky dog! He couldn't have found a better situation, or better Forever Home. Recently rescued by the Devlins, Rusty was a bit under the weather at first. He was a stray dog for many moons. 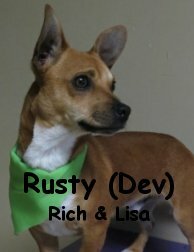 Then, after a couple of weeks with his new family; consisting of proper nutrition, love, and care, Rusty was feeling great, and was more than ready to take on the fun of The Fort. He met up with the Little Roll crew this morning and fit in with them seamlessly. Rusty thoroughly enjoyed socializing, and, was all about play. He wrestled it up with several different canines, taking quite a liking to Cortez. Rusty reminds us of Cortez a lot, he has a very similar sweet disposition. "Rad Rusty" passed his assessment with flying colors, and please note, the decision to pass him was not based on Dempsey's Legacy. This little fella is more than welcome, due solely to his actions, and on his own accord. Hahaha! Louis tearing it up with his buds!